When dealing with the myriad of emotions stemming from newly diagnosed breast cancer, patients may overlook or not be aware of the options available in breast reconstruction. The physical and emotional consequences associated in the past with mastectomy need no longer be a factor. Great strides have been made in reconstructive surgery, and women who have breast cancer today have new and better choices. A variety of surgical techniques have made it possible to re-create a breast that comes close in form and appearance to matching a natural breast. Located within the California Pacific Medical Center, San Francisco plastic surgeons Gabriel Kind M.D. and David S. Chang M.D. offer patients an individualized approach to sort through the many choices open to them during their journey to rebuild their breasts. 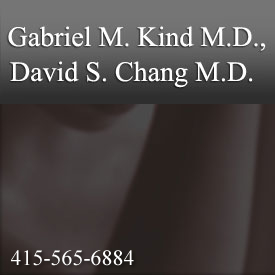 Dr Kind and Dr Chang offer breast reconstruction surgery to patients from San Francisco and the rest of the Bay Area. Inside this website, you will find a comprehensive guide to breast cancer reconstruction. Please contact Dr. Kind or his staff for any questions, or if you would like to schedule a consultation.